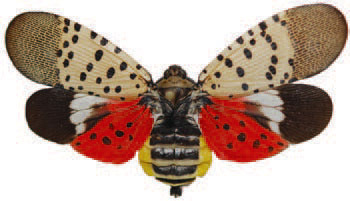 Pest Alert - The Spotted Lanternfly (Lycorma delicatula ) - Healthy Tree PHC, Inc. The spotted lanternfly (Lycorma delicatula )is an invasive sap-feeding planthopper, first discovered in the United States in Berks County, Pennsylvania in 2014. Field observations indicate that the tree of heaven, Ailanthus altissima, is an important host plant; however the spotted lanternfly is known to feed on a wide range of hosts including wild and cultivated grapes, stone fruits, willow, and various hardwoods. This species is thought to be native to China, and has spread to other Asian countries. In 2004, it was first detected in Korea, where its populations expanded and it became an economically important pest of grapevines and fruit trees. In Korea, it damaged plants directly by phloem feeding, but also caused indirect damage due to mold that grew on honeydew excretions deposited on the leaves and fruits of host plants. It was recorded utilizing 67 host plant species in Korea, many of which also occur in the U.S. Given the wide range of hosts it feeds upon, the spotted lanternfly poses a serious economic threat to multiple U.S. industries, including viticulture, fruit trees, ornamental’s and timber. Given that egg cases are deposited on such a wide variety of surfaces, this is the life stage that may have the greatest potential for spread via accidental transport to new areas. As of December 2016, the spotted lanternfly has been detected only in the southeastern region of Pennsylvania, specifically in areas surrounding Berks County. Nymphs are flightless and may pose less of a threat for spread. However, they have been observed feeding upon over 30 species of host plants in Pennsylvania, demonstrating the spotted lanternfly is mobile and capable of dispersing to some degree as immature’s. The primary host, tree of heaven, is itself an introduced invasive species that occurs throughout much of the U.S. It is considered an edge species and grows quickly in disturbed sites, including along roadways and powerline corridors. 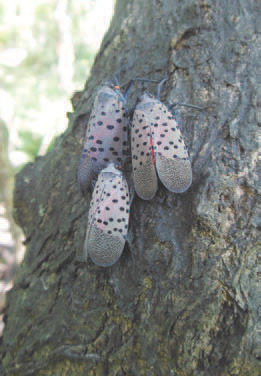 As such, corridors of tree of heaven may provide opportunities for spotted lanternfly to spread. Although adults are capable of flight, they are relatively weak flyers, relying instead on strong jumping to evade danger. Mated females pose a high risk for establishing new populations by accidental transportation on vehicles, such as open bed trucks, and introduce their offspring to new areas. Infested municipalities are under a quarantine that covers all living life stages of the pest and its conveyances. Trees of heaven fed upon by congregations of adults may exhibit weeping of sap along the trunk as well as build ups of honeydew excrement. Black sooty mold fungus grows on the honeydew on the tree as well as on surrounding soil and under-story plants. Weeping sap and/or honeydew build ups attract ants, bees, wasps, hornets, and flies. USDA, APHIS has conducted several pesticide trials with many pesticide materials and should make their findings know in January 2018.